Established since July 2015, it has caught many attentions of social medias and gain positive reviews from their patrons. Inspired by the concept from Taiwan's famous Aplus Dining Sake Bar, Hana offers a wide range of Japanese fusion cuisines as well as the sakes. There is this huge collection of sake rack just on my left side of the walkaway. The left side will leads you to the Bar Area. This is for hangover people. Right side is the Dining Area. Calm and chilling, perfect for family group. We were escorted to the dining area so we could carry out our blogger duty. Of course, Hana will still be able to bring your sake & meals together to either of this dining areas. 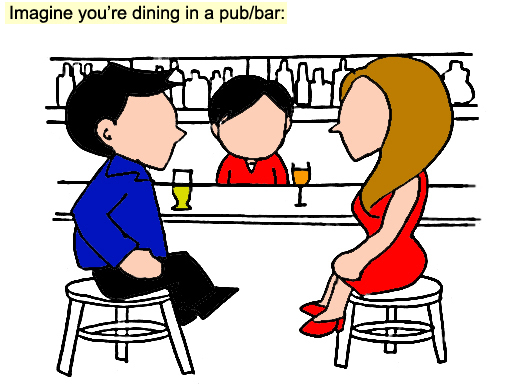 Customers are free to choose which area to dine in. 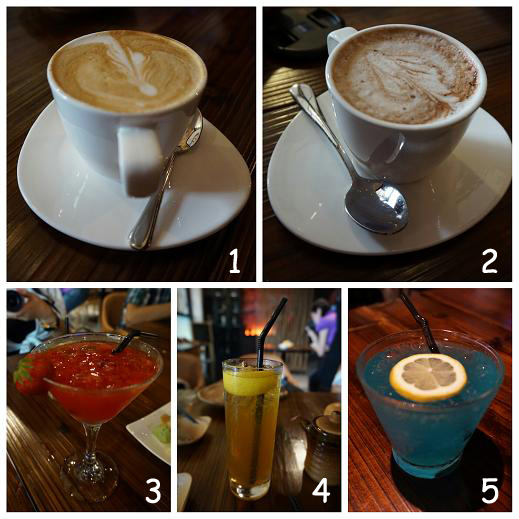 Drinks ordered by food inkers. From coffee to cocktail, Hana got it all! In terms of food, Hana has over 60 types of sauce and condiments, featuring 130 types of dishes and 28 sets of valued meal. All the ingredients and recipes either come from Taiwan or air-flown weekly from Japan. With the freshest ingredient used, some very exquisite ones too, all items in the menu is crafted perfectly and beautifully. Some foods will need a final touch once it arrives on your table, with purpose of enhancing the taste of your food. All foods in Hana are carefully paired with different ingredients according to the taste, texture and colour. With the chef's final touch, I can taste the burning sensation from the sushi. Its outer layer melts inside my mouth, giving me a warm and fresh feel. Would you believe its outer later is actually a squid? I love how chewy and bouncy it is! Highly recommended! I heard that it was very delicious! (Some food inkers claim that this is her favourite of the day.) How can you say NO to those salmon? If you are a cheese lover, you probably will like this. Pairing with cheese on top of your california roll, my kind of heaven! This is my favourite! How does the chef able to prepare such a fine, smooth, refreshing tuna?!? Behold, the star of the dish. Highly recommended by Stella! 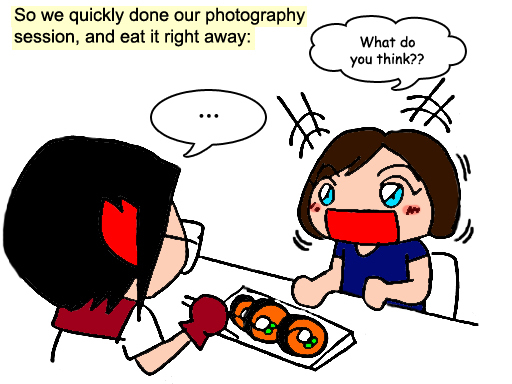 Now I understand why Stella advices us to consume the sushi right away. Especially with this one. I think I've left my Hawaiian Sakae for too long, that I've only manage to taste the cooling part of its salmon (not sure if it's salmon, but it's the thickest, yet delicious & freshness salmon I've ever tasted!! ), and also the warm center part. According to Stella, the center part was suppose to melt the whole sushi when it's still in heat, creating a heavenly taste inside your month. Oh well, guess I've missed it. But still, the salmon is DA-BOOM! I highly recommended this dish. Make sure you take it right away within 3 minutes!! And also the eggs. It does pair well with the rice I don't feel it's just another ordinary don. Some sort of Japanese + Italian fushion. The noodles were smoothly made. If you are craving for chicken, try this. Not too salty and oily, you'll never be disappointed! Juicy, tender lambs, couldn't resists the temptation! My another highly recommended. How can the omelete be cooked so smooth?!? A salad is a must to enhance my craving for food. I want more of that crispy salmon skin, please. Doesn't it looks like a layered cake? It's consists of chicken and egg. I personally like this dish as the taste are rather acceptable to me. However, some food inkers doesn't like it. Right beneath the cold udon is a bucket of ice, with purpose of retaining its cooling effect of udon. Mixing with the sesami sauce, it creates bouncy and refreshing feelings inside your month. Mr Eddie personally loves beer. 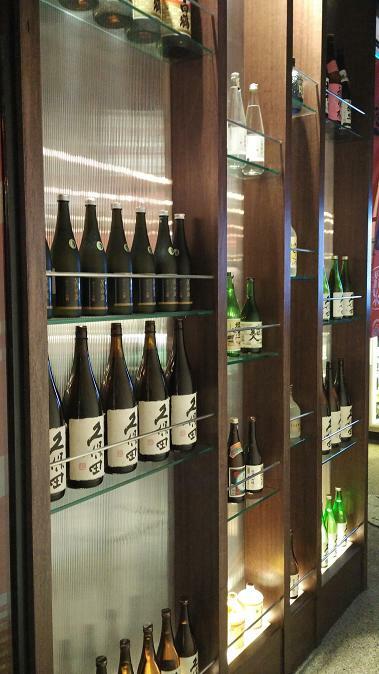 Combining with his love for Japanese cuisines leads him to open up Hana Dining & Sake Bar. With his half-Taiwanese background, he has been making countless trips to Taiwan, to search for the best Japanese cuisines, to fulfill his vision to open a Japanese fine-dining restaurant in Malaysia. One day he found Taiwan's famous Aplus Dining Sake Bar, discussed with its founder Mr Eric Lee, and the rest is history. To order to enhance customer's dining experience in Hana, they even had private VIP room, subject to booking. The gigantic poster shows their best selling sake bear, comes with RM 290 for one! According to Mr Eddie, it has been sold out within a couple of weeks. 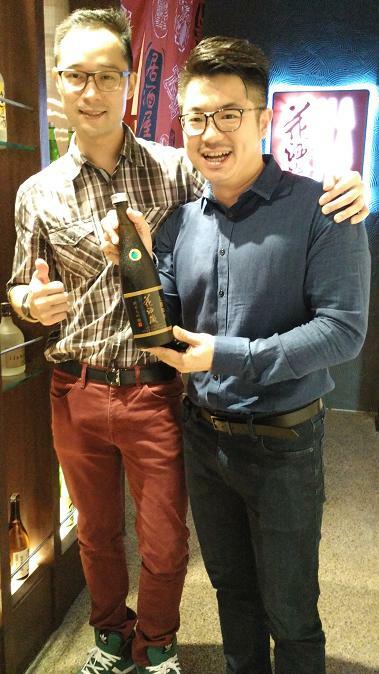 Together with Mr Eddie's partner / COO of Hana Dining & Sake Bar, Mr Jon, they will make a twosome team! If you are having a special occasion, come visit Hana and discuss with the staff. They are more than delightful to customize a Omakase lunch or dinner according to your budget. To secure some rare Japanese ingredient, do come visit Hana at least five days ahead for the kitchen to have sufficient time to prepare your food. If you are a hangover person, or wanting to experience a different kind of sushi, or both, come visit Hana Dining & Sake Bar to experience the differences! Do check out Izakaya Kushi Raku at TTDI for great Japanese pub grub and drinks. Full write up here. (Dinning area) 11am - 3pm, 6pm - 11pm. (Bar area) 11am - 1am. Special thanks to Hana Dining & Food Ink for inviting me to this different kind of food tasting experience! *华语版本的 Hana Dining 可以参考 咔咔丽娜 文章. We have to revisit this restaurant! Miss their foods so much!!! Your cartoons really creative. Sushi with Sake. Seems interesting. Will try it out. looks like a nice place to dine. Love sushi with Sake, shall check this place soon. The comic is so cute and salmon looks so fresh. I'll go and give it a try! Your animation work is pretty and creative! Layered chicken and egg teriyaki look so special when place in the wine glass, hahahaha! wow some of the dishes here look so interesting! I would love to try that amazing-looking tuna and the melting salmon!! Aww love your drawing! So nice and attractive! Makan sushi at bar definitely a great experience! Gonna try it out soon! Loved their food presentation and food indeed is so tempting. Though some of the dishes i have not tried yet. Wow the food looks fusion and impressive. I want to try the Hawaiian Shake Harasu Maki. 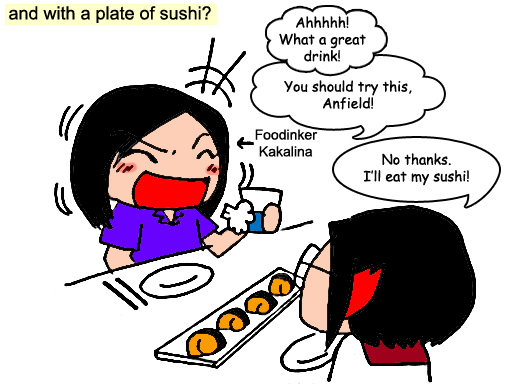 Hi sin yee, I like the way you draw to illustrate hour food review 😊👍🏻 nice! Keep up the good drawing effort! the star dish definitely looks like to die for, so much salmon in there! 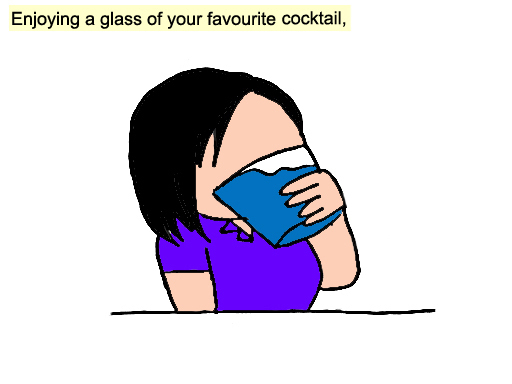 btw your cartoons are too cute! lots of effort put in there. will visit often. OMG! The place is Japanese-y and yet contemporary! I love the food too! Will go and try to go here. Your review is so cute, with the added comics! 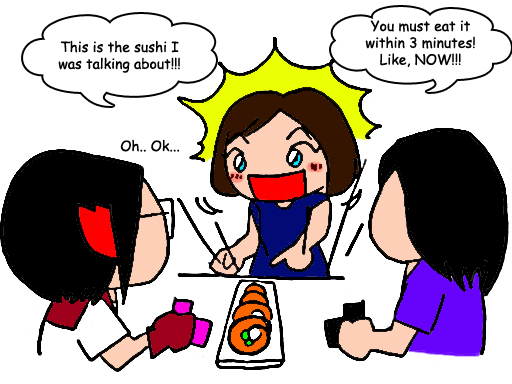 Haha~~ I like Japanese food! Yummy! @alizasara, they probably serve the best salmon in town tho! @cecilia Qianqian, thank you thank you! :D But that's not the star dish tho lol. @Isabel Lee, please do! Their salmon is so delicious! @Pamela Yeoh, have you tried before? @Mum Babies, oh you dine into Hana before? @Sharon Lee, hehe thanks! :D Then I believe you will fall in love with Hana Dining soon! @cleffairy, seldom to have a place where they open to family-oriented and hangover customer. @Leona Lim, thank you! :D Yes their star dish is simply amazing! @Jessie Koo, thank you Jessie! :D It's a good restaurant tho.